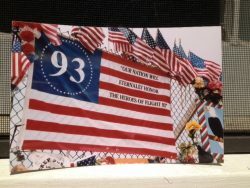 Seeing the enemy of our souls through a 9/11 lens. It was September 11, 2001, a beautiful Tuesday morning fifteen years ago today. My husband and I showed up for a meeting at a home at 9 a.m. The homeowner already had the television on. A plane had crashed into the North tower at 8:46 a.m. while we were in transit to her home. We watched and listened in horror. Then we watched a plane hit the second tower live, right before our very eyes. In real time. We left to go get our daughters at elementary school. If catastrophe was going to hit our family, we were going to face it together, arms around each other. 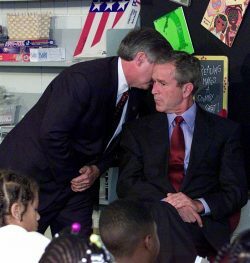 One of my favorite photos from that day is when President Bush found out about the second tower going down. * In the exact minutes of that day, while my husband and I were were rushing toward an elementary school to tend to our daughters, the president was quickly leaving an elementary school to tend to the nation. It was a day of surprise attack. It was a day that caused ramifications that still live on today for each of us. That is what well-planned, surprise attacks do. They get us. They do damage. My son and I recently finished reading Matthew together before school. Each morning he read the next little section, we talked about it a bit, and then we both prayed about something in direct response to the morning’s verses. Even more important than reading and studying the Bible is praying it into your life. The serpent was more clever (crafty) than any of the wild animals the Lord God had made. Livestock, creatures that move along the ground, and wild animals. It always astounds me how carefully the devil schemed to take mankind out (though he woefully lost). He first selected the wild animal category, then within his options he picked the craftiest wild animal to inhabit. The enemy is this deliberate in each of his moves. He thinks this hard about how to trip us and he schemes this intentionally while targeting our weakest areas. The horrible events of September 11 were planned by a group of people. Imagine some of their conversation. It may have a familiar ring to it. What date should we attack? 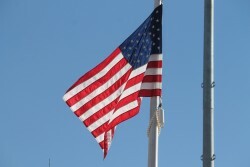 9/11, the number Americans will be calling all day long in terror, 9-1-1. Which planes should be use? Ones making long flights with large tanks filled with fuel. Of the passenger airlines flying from east coast to west coast that morning, which airlines should we use? Of the United and American flights, which numbers should be select? Doesn’t this careful decision-making about selecting planes remind you of the devil’s careful decision-making about which creature to inhabit in order to attack Adam and Eve? Then the devil had to determine the best way to get to Adam. Then he had to determine the best way to get to Eve. I get chill bumps imagining the group planning the attack on 9/11. And I get chill bumps thinking about how the devil schemes that carefully against us as well. One of the reasons I got taken out of action for a season in my life is because I wasn’t aware of such an insidious predator scheming about me in such a deliberate manner. Since I wasn’t on the look-out for his sneaky, surprise attacks, I didn’t recognize thoughts I had as being LIES aimed deliberately at ME to take me OUT. 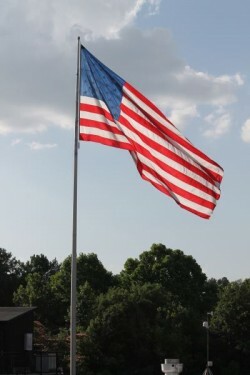 Today we remember an attack on our nation. But let’s also use today as motivation to be on the lookout for the enemy of our souls. Prayers for Nabeel: I posted last week about praying for Nabeel. I will not use my blog to focus on him any longer, but will post his updates below so you can keep up if you wish, and to keep praying. Here is is first vlog. This explains how the diagnosis unfolded and why it is so important to pray for him. It’s not about Nabeel. He was diagnosed on the 11th anniversary of leaving Islam and coming to Christ. He has been deserted by his family. And now, many people think this stomach cancer is a punishment from Allah. God’s name is at stake. Either way, God’s way will be perfect, but the enemy is scheming to destroy this story so many are praying protection and healing. 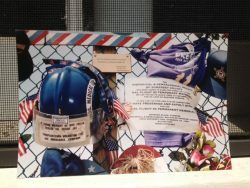 Photos of makeshift memorial at Shanksville crash site taken by a friend.